The best lessons are learned by doing, or at least trying. 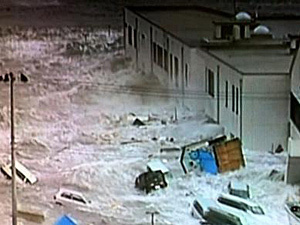 Japanese television is showing horrific pictures of a wall of water swallowing everything in its path following a massive 8.9 magnitude earthquake struck off the northeast coast of Japan. The quake has triggered a tsunami already that’s washing away cars and houses inland in the north-east of the country. Television showed cars bobbing in water alongside fishing boats. A 10-metre tsunami warning has been extended for the coast in the region. The tsunami warning was issued to most of the Pacific coast of the main island of Honshu, broadcaster NHK reported. People are being told to get to higher ground. The quake was initially listed as 7.9 magnitude, then upgraded to 8.8, then 8.9 by US Geological Survey. A series of aftershocks followed including one of around 7 magnitude. The epicentre of the quake is believed to be in the north of Japan, in the Honshu area. The quake caused buildings to shake in the capital Tokyo, triggering at least one building fire, NHK television and witnesses reported. Around four million homes are without power in Tokyo, and several people have been buried in a landslide. Many sections of Tohoku expressway serving northern Japan are damaged and there is a major fire at Chiba refinery near Tokyo. The BBC is reporting it as a “mega-quake”. Narita airport, Tokyo’s main airport, has been closed. A number of people are believed to have been injured during a graduation ceremony in Tokyo when a roof collapsed. The public broadcaster showed black smoke billowing from a building in Odaiba, a Tokyo suburb, and bullet trains to the north of the country have been halted. “The building shook for what seemed a long time and many people in the newsroom grabbed their helmets and some got under their desks,” Reuters correspondent Linda Sieg said. The US Geological Survey verified a magnitude of 8.8 at depth of 24.3kms and located the quake 130.3kms east of Sendai, Honshu. The stock market extended its losses after the quake. Japan’s northeast Pacific coast, called Sanriku, has suffered from quakes and tsunamis in the past and a 7.2 quake struck on Wednesday. In 1933, a magnitude 8.1 quake in the area killed more than 3,000 people. Last year fishing facilities were damaged after by a tsunami caused by a strong tremor in Chile. There are believed to be 3500 New Zealanders in Japan, and 1600 in Tokyo. Civil Defence in New Zealand says a tsunami is possible in New Zealand, but it is still monitoring the situation and it would be 11 hours away. My latest release from the film 'ISAI' Composed and Directed by Mr.S.J.Surya. A kuthu song with english lyrics penned by moi... so excited to have had the opportunity to sing and write such a fun filled peppy number. Hope you all like it! My song 'Kadhal Veesum Kaatru' from Nalanum Nandiniyum is the first track on the jukebox.